CLP was associated with a diminished ability to clear bacterial challenge. Mice challenged with live P. aeruginosa (or saline control) 5 d after CLP were sacrificed 6 h later, and spleen homogenates were plated and cultured overnight to measure bacterial growth. CLP was associated with a diminished ability to clear the Pseudomonas challenge compared with that of sham controls. Mice subjected to CLP or sham procedures and sacrificed 5 d later with no Pseudomonas challenge had little to no bacterial growth on culture of their spleen. n = 7–9/group. Caspase-1 activity was increased in splenocytes 24 h after CLP. FLICA was used to detect caspase-1 activity in splenocytes harvested from mice 24 h after CLP (left) or sham (right) procedures. The top panels shows propidium iodide leakage into dead cells (upper quadrants) and FLICA activation (right quadrants) by caspase-1 in the total splenocyte population. 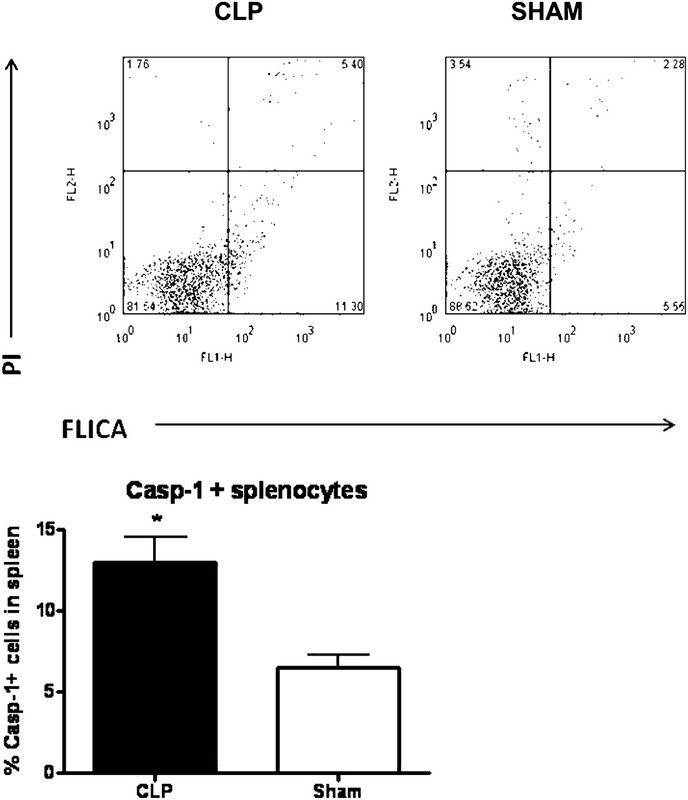 The bottom panel shows caspase-1 activity in splenocytes derived from mice after CLP or sham surgery. n = 7/group. *p < 0.05. Caspase-1 activity was increased in both macrophages and granulocytes after CLP. Spleen tissues were collected at 24 h, 48 h, or 5 d after CLP. Caspase-1 activity was measured by the FLICA assay in both macrophages (F4/80+ cells) and granulocytes (Ly6-G+ cells). n = 4–5/group. *p < 0.05. 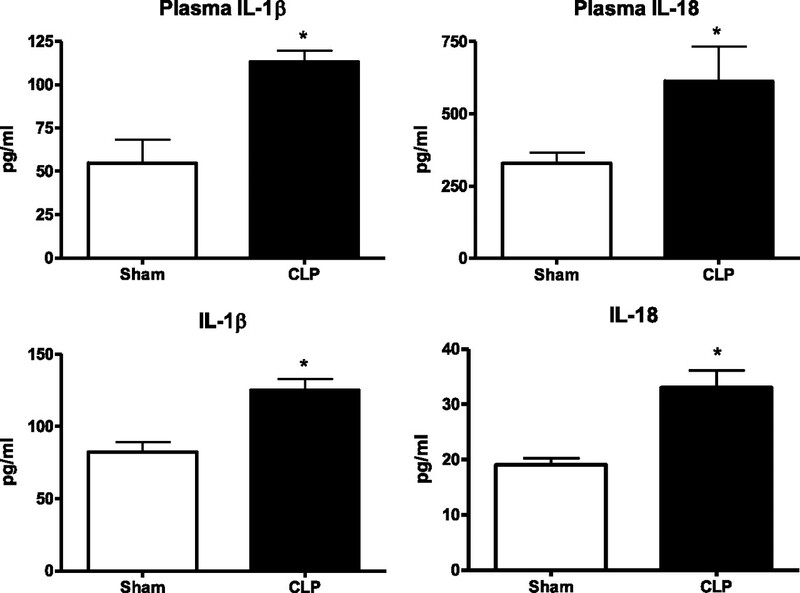 Post-CLP mice had increased IL-1β and IL-18 responses to the subsequent Pseudomonas challenge. Mice were subjected to CLP and allowed to recover for 5 d. The top panels demonstrate the higher plasma concentrations of IL-1β and IL-18 in post-CLP mice 6 h after challenge with live P. aeruginosa. The bottom panels show that splenocytes derived from mice 5 d after CLP and cultured in the presence of heat-killed Pseudomonas had higher production of IL-1β and IL-18 than that of splenocytes from sham mice. n = 11/group for IL-1β, n = 4/group for IL-18. *p < 0.05. Mice deficient in caspase-1 activity did not demonstrate CLP-induced impairment of clearance of a subsequent Pseudomonas challenge. Wild-type mice subjected to CLP had higher numbers of Pseudomonas CFUs in spleen tissue 6 h after a Pseudomonas challenge than those of mice subjected to sham procedures. 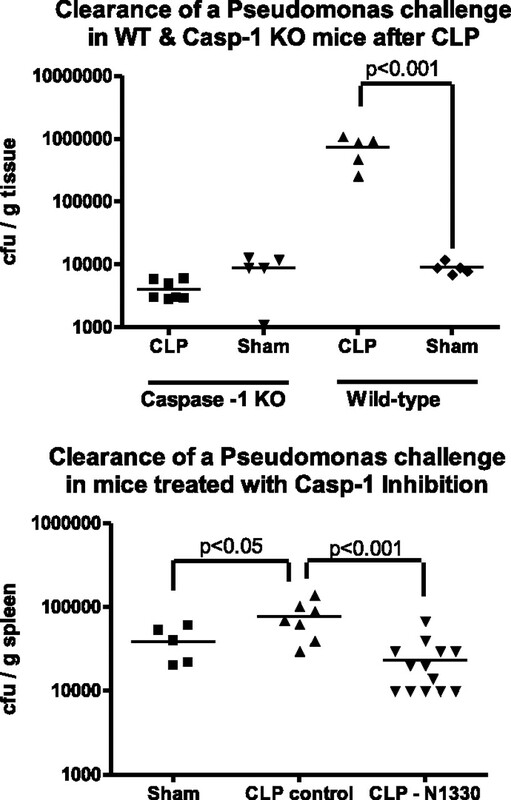 However, caspase-1 knockout mice subjected to CLP did not differ from sham mice in the amount of Pseudomonas isolated from spleen tissue after a Pseudomonas challenge (top panel). Wild-type mice treated with a specific caspase-1 inhibitor after CLP had less Pseudomonas bacterial growth in spleen tissue compared with that of nontreated CLP mice and did not differ significantly from that of the sham control mice (bottom panel). n = 5–13/group. Mice deficient in caspase-1 activity had no detectable IL-1β or IL-18 but had similar changes in the serum IFN-γ and IL-10 cytokine response to a Pseudomonas challenge as those seen in wild-type mice after CLP. Caspase-1 knockout mice subjected to CLP had no detectable circulating concentrations of caspase-1–dependent IL-1β or IL-18 in response to a subsequent Pseudomonas challenge. 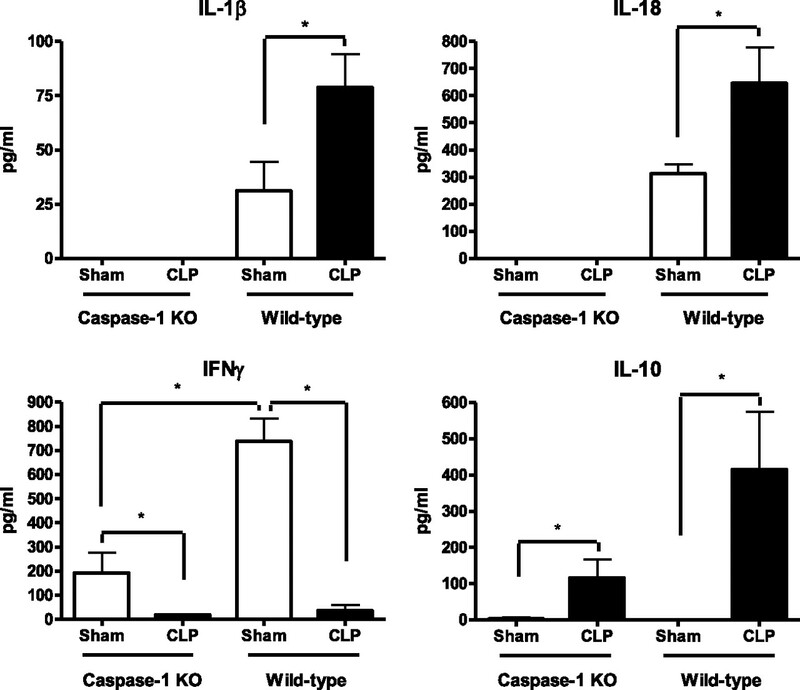 Both caspase-1 knockout mice and wild-type mice that were subjected to CLP had similar suppression of the IFN-γ response and exacerbation of the IL-10 response to a subsequent Pseudomonas challenge compared with those responses in sham mice. n = 5–7/group. *p < 0.05.